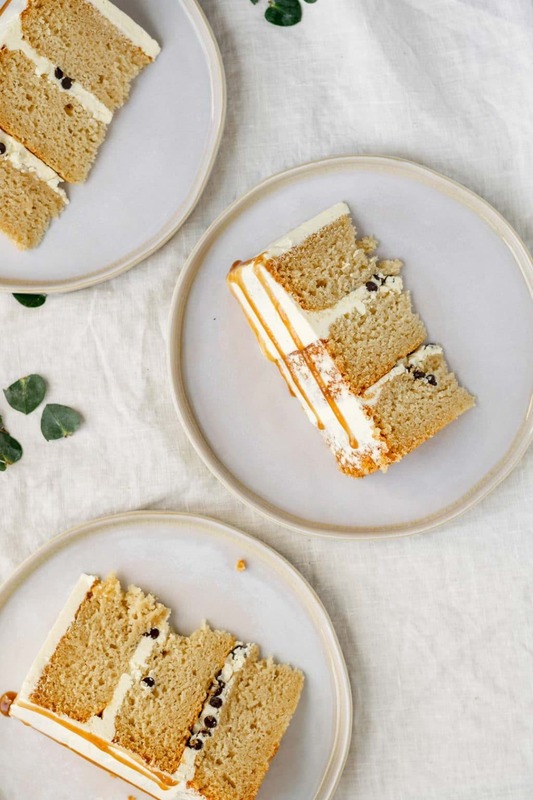 This easy vegan vanilla cake is the perfect dessert for birthday parties, graduations, weddings or just because occasions. Nothing says happy like a soft and sweet vanilla cake and creamy frosting! This white cake has it all–it’s fluffy, has the most tender and moist crumb, and a deep vanilla flavor. Dress it up with some fancy buttercream work or keep it simple with a drizzle of chocolate ganache, this cake is sure to delight! 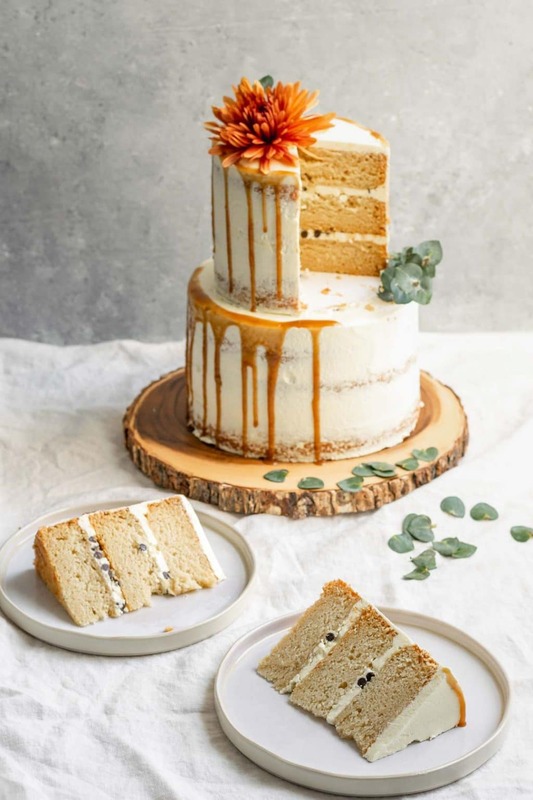 It’s admittedly a lot harder to make a good vanilla cake vegan than it is to make a chocolate or other strongly flavored cake (carrot, apple, red velvet–you get the idea). Vanilla is a delicate flavor that is easily overpowered if you use the wrong ingredients or even the wrong proportions of ingredients. White cakes also have the propensity to come out dry, for whatever reason. 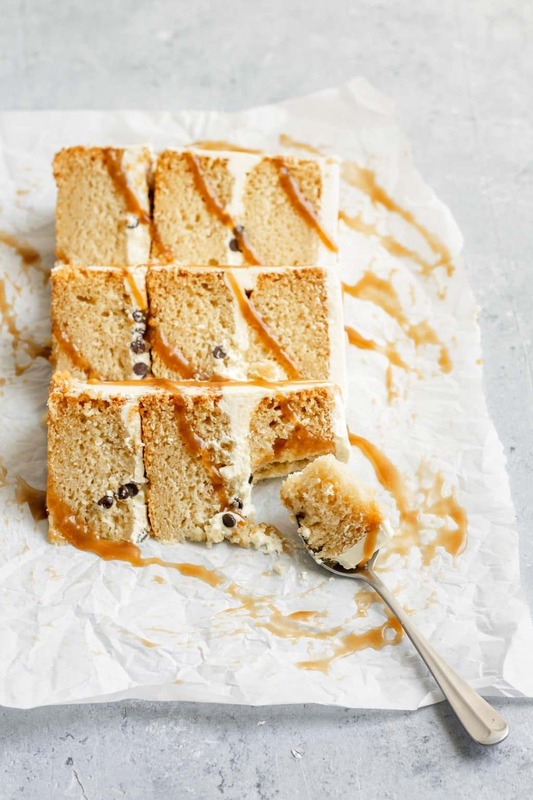 This recipe is everything you want from a vanilla cake and more! Even better that it just happens to be vegan. Making vegan cakes is a unique process from their egg and dairy counterparts, but the results are equally tasty! Traditional baking uses butter to whip air into a batter and eggs for structure, stability, and leavening. We switch out butter for a neutral flavored oil (like canola or safflower), and depend on leavening from baking powder and baking soda. To start we clabber the plant milk with apple cider vinegar to make a quick buttermilk. While most non-dairy milk options will work, soy milk, almond/cashew milk, and oat milk will have the best results (and please don’t use rice milk which is too watery). Adding a little vinegar to the recipe does a few things: it reacts with the baking soda for leavening, it tenderizes the gluten formation for a softer cake, and it slows down browning as it lowers the pH of the cake. Next, we mix together the dry ingredients. I’m a huge proponent of weighing your ingredients as there is very little room for error if you weigh. 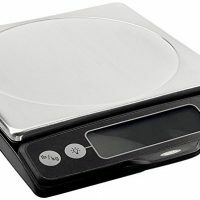 Kitchen scales are inexpensive and yet one of the best investments you can make if you love to bake! If you’re measuring by volume, I ask that you measure your flour in this specific way: First whisk the flour in its container to fluff and undo any settling of the flour. Then scoop with your measuring cup so it’s overflowing. Remove the excess by scraping across the top with the back of a knife. This is how I measure, so for best results you should do the same! Also keep in mind I use US standard measuring cups, which are a little different than UK and Australian. With the flour we add in the granulated sugar (use organic or a certified vegan one if you’re concerned about bone char in the mix), baking powder, baking soda, and salt. Whisk everything together so it’s fluffy and well combined. Then to the buttermilk mixture, mix in oil and vanilla extract until smooth. Use a good quality pure vanilla extract, this recipe calls for a lot of vanilla and the flavor really shines through at the end. We add the wet ingredients to the dry, and mix with a whisk. While with egg-based cakes you have to be very careful to not over whisk, this is less of an issue with vegan cakes. In fact, a little gluten development through whisking helps build the structure and stability of the cake. Don’t over do it, just mix the cake batter just until it’s nice and smooth. Do not add the wet ingredients to the dry until 1) your oven is preheated and 2) your baking pan(s) are prepared. Once the wet ingredients are added the baking soda will immediately begin to react, so waiting to bake your cake will result in a flatter and less desirable result. The cakes are baked at 350 ºF. This relatively low temperature keeps the cake from browning too quickly on the outside, and helps lessen the doming of the cake. Watch for visual cues that you cakes are done baking. When done, the edges of the cake will be golden and have started to pull away from the sides of the pan. A cake tester will also pull out clean, or with one or two crumbs. If there is any stickiness then continue baking it until done. If you open the oven door too early in the baking process, this can cause the center of the cake to collapse. An oven light helps you keep an eye on the cake to watch for the visual cues before opening to test. To prep your baking pans, I use a method I learned from the vegan dessert guru, Fran Costigan. I spray a coating of oil inside the pan, then add a piece of parchment to cover the bottom. I love buying the precut parchment circles, but you can also cut them out yourself. This method allows for easy release from the pan, then just remove the parchment paper from the bottom and you’re good to go! This post is more about baking the cake than decorating. But just a few quick notes to set yourself up for success. Always chill the cakes before frosting. Cold cakes = less crumbs = a better finish on the frosting. This is also true if you plan on cutting off the top of your cake to level, or to cut it in half to create more layers. 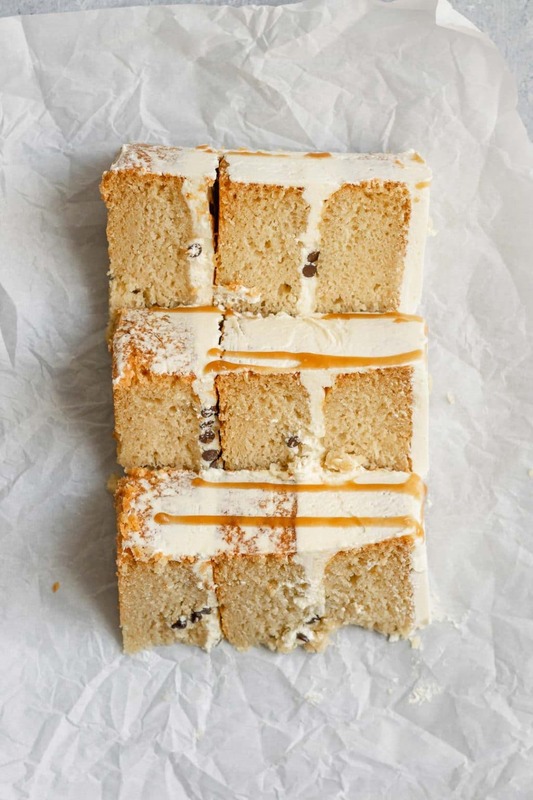 Use cake boards when wrapping up your cakes to refrigerate as they will keep the bottom of the cake nice and flat. 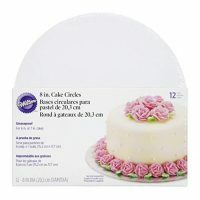 While you could cut up clean cardboard or foam core board to size, you can also just buy pre-cut cake cardboard. I used my Vegan Aquafaba Strawberry Italian Meringue Buttercream on this cake, minus the strawberry part. Feel free to use that recipe (and check out that post for a step by step photo tutorial of frosting a cake). You can make the buttercream in advance–it freezes well–and then rewhip (defrost in the fridge if frozen) to fluff it back up for easy spreading. I sprinkled mini-chocolate chips between the layers after adding the buttercream. These led to a nice textural contrast to the cake, and I love me some chocolate! If you’re unsure where to find them, Enjoy Life Foods makes vegan chocolate chips in full size and minis. Lastly I drizzled some Vegan Salted Caramel Sauce over the cake, and used the recipe from my friend Cupful of Kale. 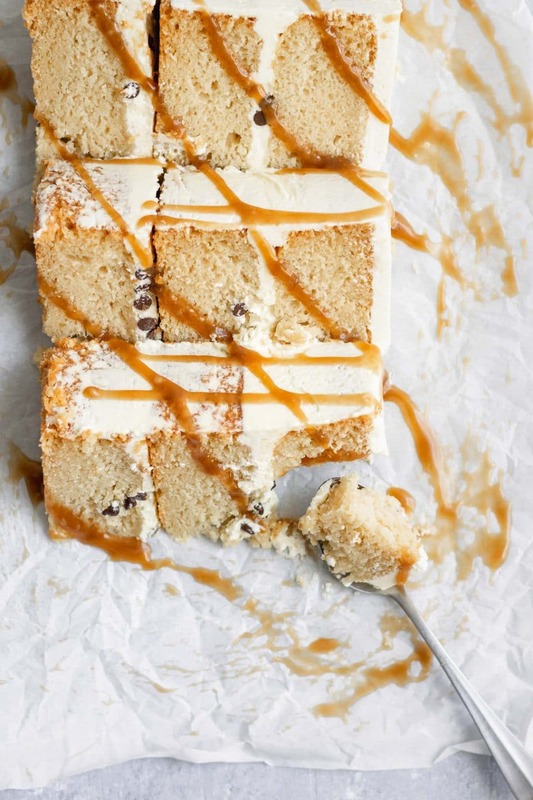 The salted caramel is made from brown sugar and is sooo delicious, we found ourselves drizzling it over each slice of cake to serve! If you’re going to use fresh flowers to decorate make sure to do so in a food safe manner! Here’s one nice article on How to Decorate a Cake with Flowers by Olive and Artisan. Just make sure you do your research on how to safely use flowers if you are going to do so! I made this cake as a tiered cake because it was a test for the cake I am making for my friends’ wedding. It held up beautifully sitting out on the counter overnight, and the ultra moist and tender crumb makes for the most delectable cake! There are plenty of tutorials online if you wish to do the same. Or if you ask nicely, maybe I’ll make one too 🙂 ! If you make this cake, please let me know! Give the recipe a rating and leave a review below! Also don’t forget to share your creations with me on Instagram, tag @thecuriouschickpea and #thecuriouschickpea, I absolutely love seeing your photos! Vegan cakes have a tendency to be stickier than their non-vegan counterparts, so keeping the cake cold before decorating is extra important. 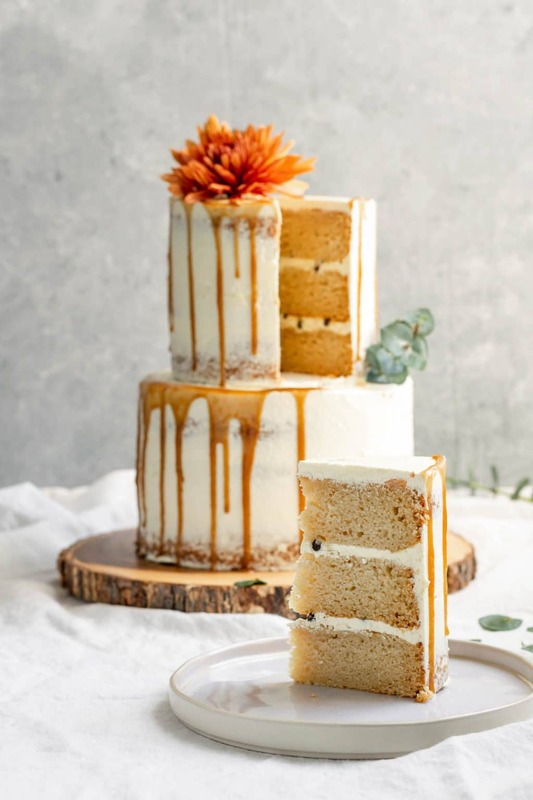 The cakes should be refrigerated until thoroughly chilled before leveling or torting (cutting the cake into 2 or more layers) and before frosting. The cake shown here has a bottom tier of three 8″ cakes and a top tier of three 6″ cakes. The batter for one 8-inch cake is divided in half to make two 6-inch cakes. So to make this exact set up use the ingredients to make two 8-inch cakes plus one 8-inch cake. Then make another one of the one 8-inch cakes to divide into two 6-inch cake pans. For a third cake, the 8-inch cake ingredients in half. This vanilla cake has a soft, tender, moist crumb and just happens to be vegan. It's easy to make and the perfect cake for birthdays and celebrations! Preheat the oven to 350 ºF. Prepare the baking pan(s) by spraying with oil then placing a parchment paper circle to cover the bottom of the pan. In a mixing bowl add the plant milk and vinegar and set aside to clabber for 5-10 minutes. In a second mixing bowl whisk together the flour, sugar, baking powder, baking soda, and salt until fluffy. Add the oil and vanilla extract into the clabbered milk and mix to combine. Add to the dry ingredients and whisk until the batter is smooth. Pour the batter into the prepared pan (or divide in half if baking 2 cakes). Bake the 8" cakes for 36-38 minutes, bake the 6" cakes for 31-33 minutes. The cakes are done when the edges are golden and have pulled away from the sides of the pan and a test comes out clean or with one or two crumbs. Remove from oven and let cool for 10 minutes. Then working gently, turn over the pan with a wire cooling rack to catch the cake. Remove the pan, then peel off the parchment paper. Turn the cake back right side up and leave to cool fully on a cooling rack. Place the cooled cakes on a cake board and wrap tightly in plastic wrap. Place in the fridge or in freezer-safe ziplock bags in the freezer until ready to decorate. *To properly measure the flour: whisk to undo settling, scoop, then level. Measuring any other way could result in too much or too little flour. If possible it is best to use a kitchen scale. 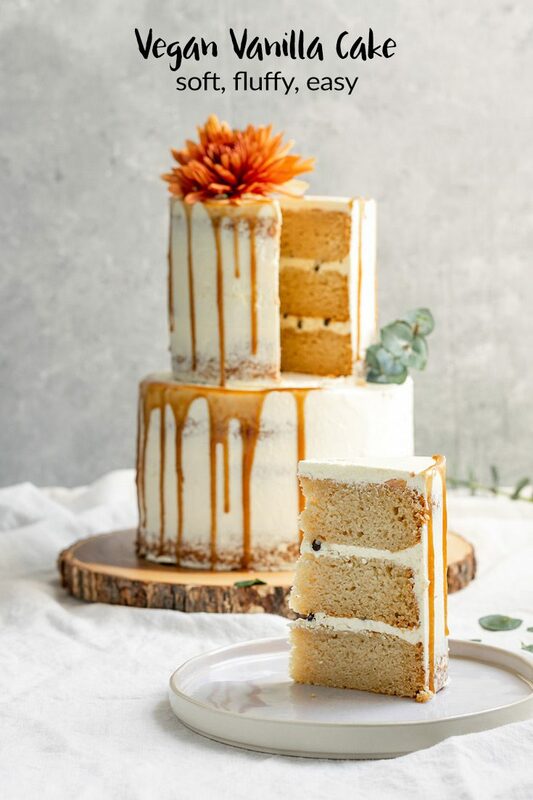 This cake was decorated with my vegan aquafaba italian meringue buttercream (minus the strawberry sauce), with mini chocolate chips between the layers, and a vegan salted caramel sauce drip by Cupful of Kale. 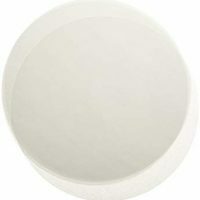 Regency Wraps Parchment Paper Circles - 8"
Wow Eva, gorgeous and I bet its delicious ? This is a wonderful recipe. I made three tiered 10 inch and 6 inch cakes for a baby shower and they came out absolutely lovely and the guests just loved it. I waited for the compliments to roll on before blowing their minds by telling them it was all vegan. The cake bakes just beautifully and the flavor and texture is very good. I have to tell you that I had practiced another vegan vanilla cake and I wasn’t thrilled by it, but I was running out of time to experiment. I decided at the last minute to make yours instead because I liked that it had both soda and powder. I am so glad I did. The couple things that are different in your recipe made all the difference! Hi Katie, I’m so glad you and your guests enjoyed the recipe so much! Thank you so much for reporting back! Hi Rebecca, yes it does freeze well. You can see the instructions for freezing in the last step of the recipe. Double wrapping the cakes is important for avoiding freezer burn! Hi! There is a recipe for 1 8” cake or 2 6” cakes, and one for 2 8” cakes. Does the number of cakes signify each layer it makes or a full, 3 layer cake as shown in the picture? I would like to make one 8” cake with three layers. How would you recommend I approach this? Hi Morgan, I’m sorry it’s not clear! I tried to give options so you can make the size and amount of cakes as you want. Yes, each number of cakes refers to the number of layers you get. So bake three cakes to get a final 3-layer decorated cake. 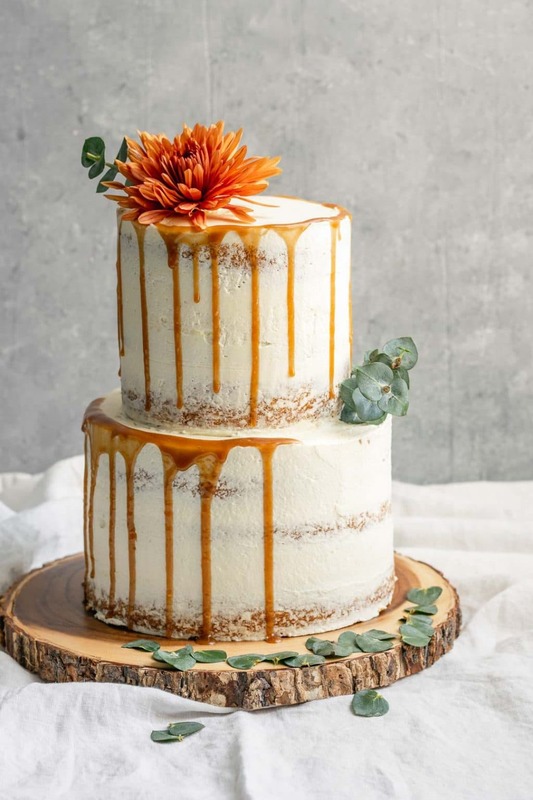 The batter for the “One 8″ cake or Two 6″ cakes” can be used to make either one 8″ cake or two 6″ cakes (if you look at the volume of an 8″ cake it’s about equal to the volume of two 6″ cakes). So, for your 8″ cake with three layers, make one of the 1 8-inch cake amounts of batter plus one of the 2 8″ cakes. All I did was multiply the first one by two for you! If you have three pans and can bake all at once, just multiply the 1 8″ cake recipe amounts by 3 to do so. Hopefully that’s clear? If not I can try to clarify further! What do you think about using applesauce in place of the oil? Hi Lori, so typically apple sauce works pretty well as a substitute for oil. You don’t get the same exact results but if you need to bake oil free then I suspect it would work. I personally would just substitute half the oil for apple sauce if that’s the route I was going. Also, apple sauce is sweet so I may cut back just a little with the sugar so the cake doesn’t get too sweet. If you do try it please report back so we know how it came out! Hi Rosie, I’m sorry to say I don’t have a lot of experience with gluten free baking so I’m not sure if you could substitute an gluten free flour and get the same results. If I were going to try it, I would use a gluten free all purpose blend, but it’s probably best to start with a recipe that is already gluten free. This looks absolutely divine! Can I use cake flour instead of all purpose flour? Hi Vanessa, I haven’t tried this recipe with cake flour, but cake flour is finer and has a lower protein content than all purpose. So if substituting, you’ll want to use the same amount by weight, which is going to be a bit more volume than all purpose flour. If you try making it with cake flour let us know how it comes out! Do you have the weighted ingredients listed instead of measured for this recipe? I really want to give it a go but prefer to weigh my ingredients. Nevermind, right beside the measurements! Hi Ayla, make enough batter for two 8″ round cakes. A 9×13″ pan is going to be pretty close in volume to that! It’ll just be a bit less tall. So I made this today including the vegan IMBC…the IMBC was amazing! But the cakes I found were way way too sweet…if I drop sugar down to 300g instead of 340g, do you think I’ll need to lower the flour or it should work with all things being the same? Hi Leny, if you want less sugar you need to lower the sugar without changing anything else, otherwise you’ll end up with the same concentration of sugar. 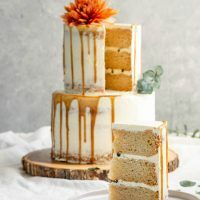 However, sugar is an integral part of the cake recipe and the moistness of the cake, so just note that if you change the amount of sugar the recipe will not come out the same. I would start with smaller changes. One other thing, is that I find vanilla to be a sweet taste, and I use more vanilla in my recipe than the average yellow cake, so you could try to reduce that a bit to see if it’s more to your liking.